Basalt Removed During the Construction of the "Euro Tunnel"
The Channel Tunnel, (or in French - "le tunnel sous la Manche"; once popularly nicknamed the "Chunnel" in English) is a 50 kilometer long rail tunnel beneath the English Channel at the Straits of Dover, connecting Cheriton in Kent, England and Sangatte in northern France. A long-standing and hugely expensive project that saw several false starts, it was finally completed in 1994. It is the second-longest rail tunnel in the world, surpassed only by the Seikan Tunnel in Japan. The "Euro Tunnel" is operated by Eurotunnel plc. Digging the tunnel took 15,000 workers over seven years, with tunneling operations conducted simultaneously from both ends. The prime contractor for the construction was the Anglo-French TransManche Link, a consortium of ten construction companies and five banks of the two countries. Engineers used large tunnel boring machines (TBMs), mobile excavation factories that combined drilling, material removal, and the process of shoring up the soft and permeable tunnel walls with a concrete liner. After the British and French TBMs had met near the middle, the French TBM was dismantled while the British one was diverted into the rock and abandoned. Almost 4 million cubic meters of chalk were excavated on the English side, much of which was dumped below Shakespeare Cliff near Folkestone to reclaim 90 acres (360,000 m²) of land from the sea. However, some of the removed material ended up in Perspex paperweights, such as this. The Channel Tunnel consists of three parallel tunnels: two primary rail tunnels, which carry trains north and south, and a smaller access tunnel. The access tunnel, which is served by narrow rubber-tired vehicles, is connected by transverse passages to the main tunnels at regular intervals. It allows maintenance workers access to the tunnel complex and provides a safe route for escape during emergencies. When the two tunnels met 40 meters beneath the English Channel seabed on December 1st, 1990, in what was to become one of the "crossover halls" that allow diversion of trains from one main tunnel to the other, it became possible to walk on dry land from Britain to mainland Europe for the first time since the end of the last ice age, over 13,000 years ago. The British and French efforts, which had been guided by laser surveying methods, met with less than 20 mm of error. The tunnel was officially opened by Queen Elizabeth II and French President François Mitterrand in a ceremony held in Calais on May 6th, 1994. In 1996, the Canadian Parliament in Ottawa, Ontario, underwent a major renovation, performed by Heather & Little Limited , during which over 26,000 square feet of 20-ounce copper batten roofing were replaced (they had been installed in 1918), as well as numerous other copper items remanufactured. The existing copper on the Clock Tower, still in very good condition, was removed, reworked, incorporating new seam connection methods. All of the decorative stamped lantern cresting, dormers, and finials where removed, restored, and returned to their original position. The deteriorated wood battens, and failing fasteners were all renewed. 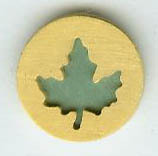 This copper pin, in a brushed gold finish, is over a half-inch (or one centimeter) in diameter, with a mint-green maple leaf cut out. Click here to purchase one from the source. The Gettysburg National Battlefield Tower was a 307 foot observation tower which stood on the battlefield of Gettysburg, Pennsylvania. It gave tourists spectacular views of the battlefield. Construction of the tower began on August 14th, 1972, and was opened to the two years later. The structure weighed nearly 2,000,000 pounds, with five miles of steel connected by 14,000 bolts. The Tower was anchored into granite with the help of 15,000 tons of poured concrete. At its highest point, it rose to 393 feet (the top of its flag pole and lightning rod), and featured a hyperbolic hourglass design measuring 94 feet at its base. The top capsule of the tower had four levels, and could hold up to 750 visitors, accessed by two elevators, or a 508-step stairwell. The structure was owned by Thomas R. Ottenstein and the Overview Limited Partnership. Ottenstein called the Tower a "Classroom in the Sky", giving tourists and school students an aerial view of the historic battlefield. However, some historians and preservationists considered it an ugly modern intrusion to the battle site, and started the campaign to have it removed. The federal government and the National Park Service seized the land by eminent domain in December of 1999, as part of an ongoing program to restore portions of the battlefield to their historical conditions. 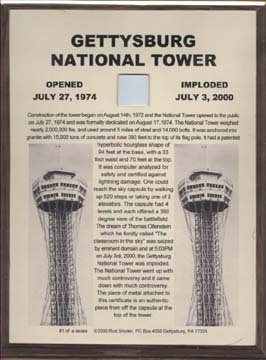 After legation, the seizure was upheld by the legal system and the tower closed permanently to visitors on June 15th, 2000. It was imploded to the sound of Civil War reenactor's simulated cannon fire on July 3, 2000 at 5:03 PM, EST. 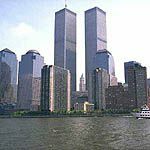 Controlled Demolition Incorporated (CDI) and the Loizeaux family of Baltimore, Maryland, donated their services to demolish the tower using ten pounds of explosives in a safe matter. In May of 2006, and after years of legal wrangling, a federal judge has ordered the National Park Service to pay $4 million to the owners of an observation tower. 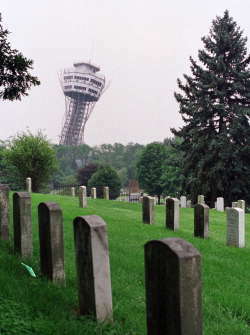 Ottenstein, however, died in August of 2000, merely a month after his tower was demolished. The bulk of the tower's galvanized steel was recycled. However, a small portion was saved and used of souvenir purposes. Attached to the certificate is a piece of metal, painted white and measuring one inch square, from the tower's capsule. The events of September 11th, 2001, forever changed the United States, as well as the entire world. The loss of and following recovery efforts at the World Trade Center left an unusual question: what is to be done with the steel and rubble at the site? Some of it was being sent overseas to be melted, but was this to be the fate of all of these historic structures. The International Agile Manufacturing company, of Statesboro, Georgia, proposed an interesting notion... The World Trade Center Commemorative Medallion was made in Statesboro, Georgia USA with structural steel from the World Trade Center site to honor those whose lives were lost on September 11, 2001 in the Attack on America. The medallions sparked controversy in the press from some relatives of the victims, but accolades and great appreciation from most. Each medallion is a unique one-of-a-kind piece made from a mold that is used only once and then destroyed. Company officials say that when they discovered that "structural steel from the World Trade Center was being sold to companies outside the USA," they believed the steel "should be used in some way to symbolize America's resolve that it would never forget the events of Sept. 11. Many IAM Foundry employees, as Americans, were outraged over the fact that the steel was being sold offshore. Most of the buyers at the time were foreign countries." Company officials say they "believe that something positive, other than selling the World Trade Center structural steel off shore to South Korea and other foreign countries, should be done. Needless to say, IAM Foundry did not initiate the process of selling the salvaged steel from Ground Zero. However, we did choose to purchase the steel and commemorate the event, rather than seeing this material recycled into soup cans and car fenders." 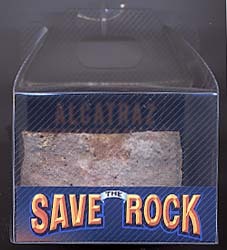 Out in the middle of the San Francisco Bay, the island of Alcatraz is a world unto itself. 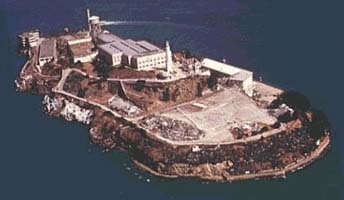 Isolation, one of the constants of island life for any inhabitant - soldier, guard, prisoner, Indian, bird or plant - is a recurrent theme in the unfolding history of Alcatraz. Alcatraz Island is one of Golden Gate National Recreation Area's most popular destinations, offering a close-up look at a historic and infamous federal prison long off-limits to the public. Visitors to the island cannot only explore the remnants of the prison, but can also learn about the Indian occupation of 1969 - 1971, early military fortifications (the first U.S. fort on the Pacific coast), and the West Coast's first (and oldest operating) lighthouse. These structures and the island's many natural features - gardens, tide pools, bird colonies, and bay views beyond compare - are being preserved by the National Park Service which is working to make it accessible to visitors, preserve its buildings, protect its birds and other wildlife, and interpret its history.